I have been putting off writing this post for some reason, but now as I am flying high above the US with a few hours on my hands, I am determined to get it done! My son requested a Paw Patrol birthday party and that is just what he had. I have shared a few posts previously. If you click on the image or the title it will take you to the post. Below you will find the rest of the details from the party. If you would like any templates, please feel free to email me and I will gladly send them along. I created this invitation for the party. I printed it on card stock and mailed it out with a single stamp. The top half of the photo shows the invitation and the second half is where I addressed each invite to the guests. I also printed our return address on the top left hand corner. I saw this idea somewhere on Pinterest and loved it so much that I recreated it for the party and added my own twist. The fire hoses are simply red licorice and the fetch sticks are pretzel rods. 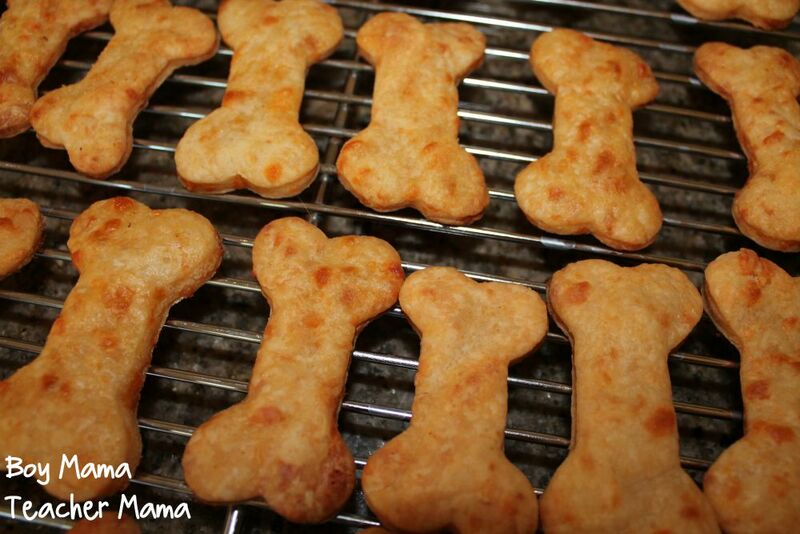 The dog bones are explained below. Click HERE to download food and drink labels. For the “doggy water,” I just added a bit of blue food coloring to the water and at my son’s request, a few strawberry flavored ice cubes. 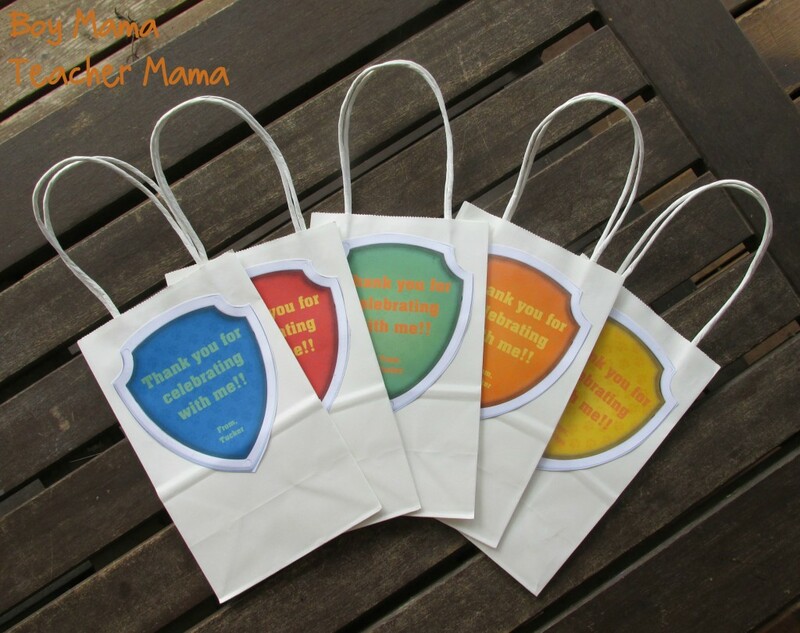 For the goody bags, I bought white paper bags and printed the labels on sticker paper and attached one to each bag. Click HERE to download the goody bag templates. 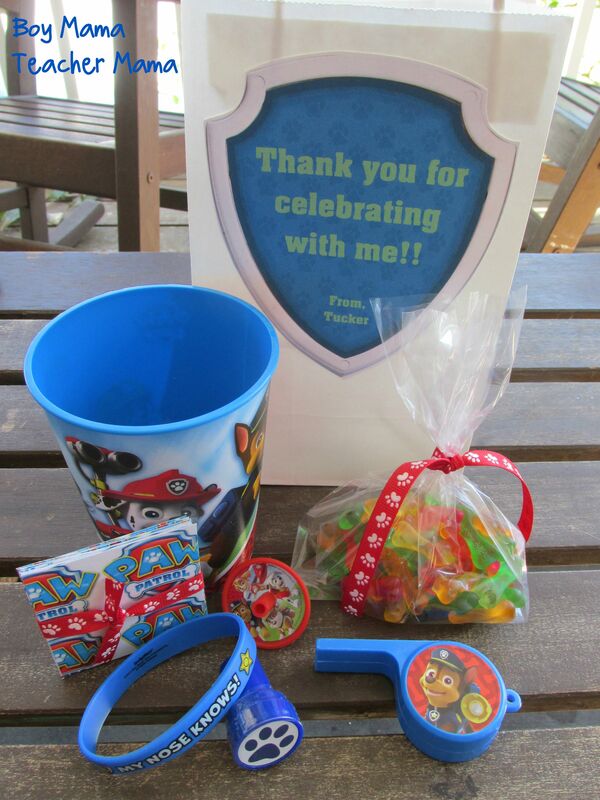 Each bag contained some Paw Patrol goodies I found at our local Dollar Store and at a local party store. 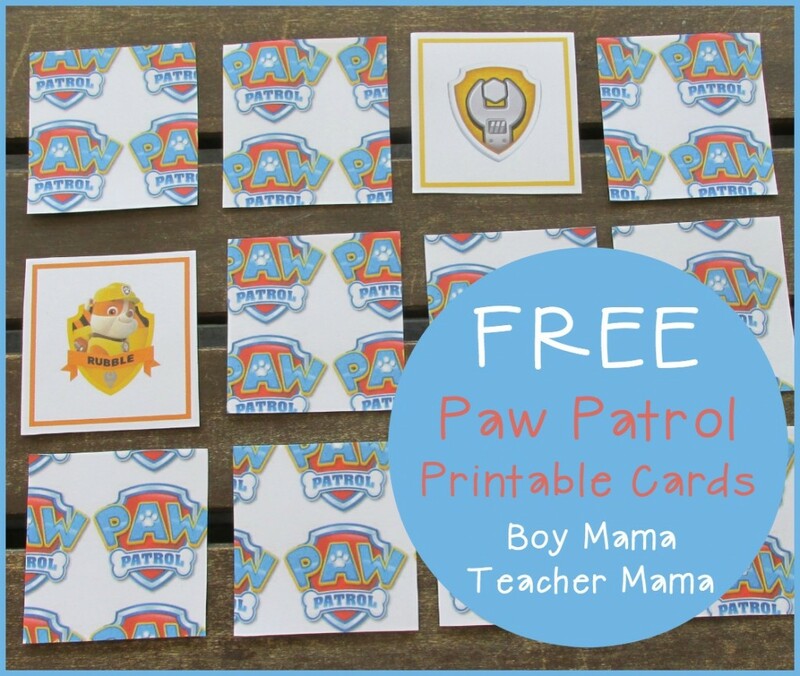 I included the Paw Patrol Memory Game I created as well. The last addition was the dog bone gummies I bought online. This game was a fun addition to our goody bags. 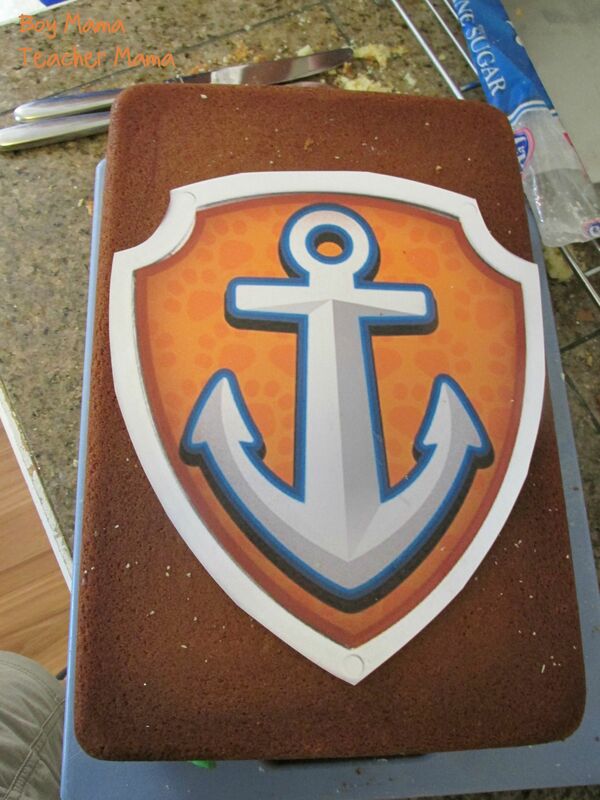 We did the same for our Octonauts party a few years ago. I enlarged and printed out this picture of Zuma and hung it on our door. 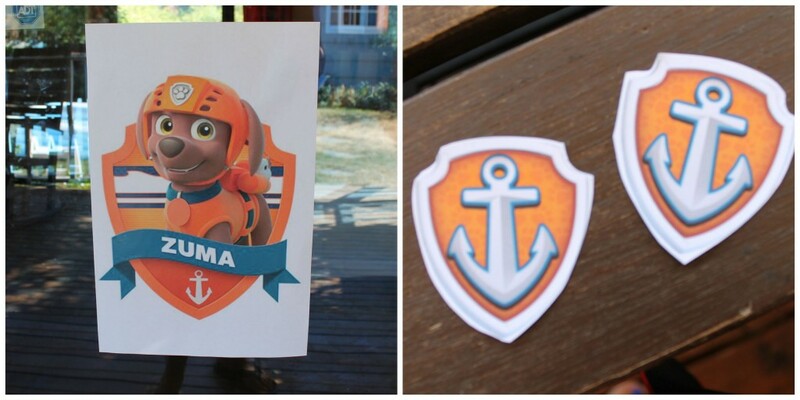 I also copied and cut out several copies of Zuma’s badge. And then we played, Pin the Badge on Zuma. Aside from the games we played, we also did some water play. 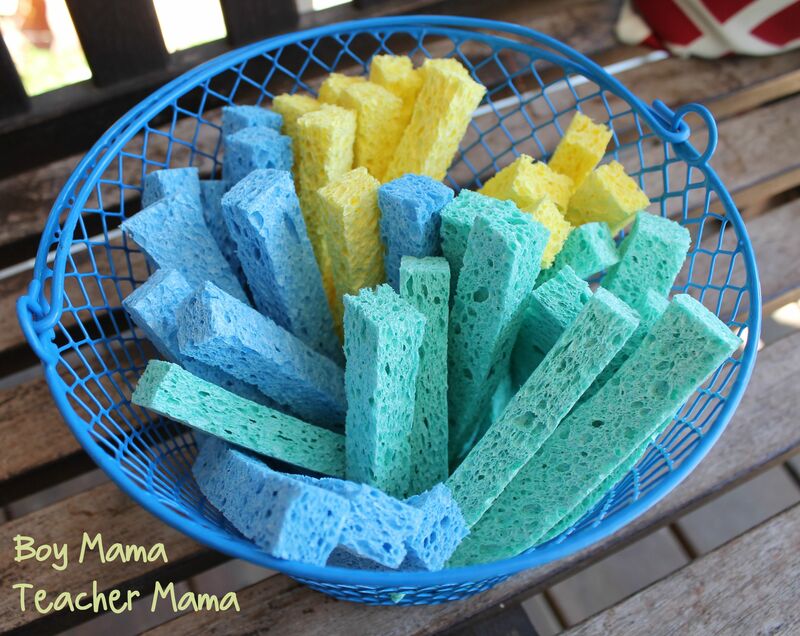 I had the kids each make their own sponge koosh balls before jumping in the pool. 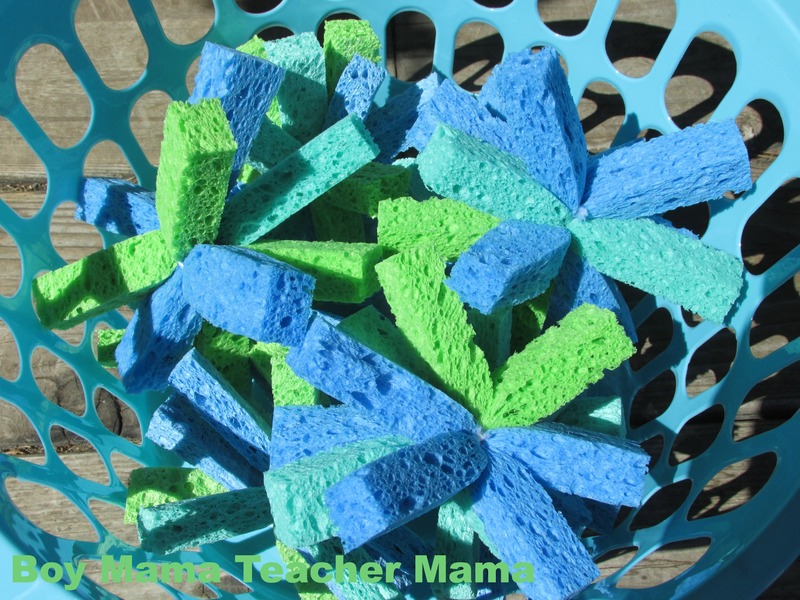 I cut up the sponges and some string, showed the kids how to make them and set to work. They needed some help tying the string, but loved picking their own colors and playing with them. To make the cake, I followed the steps laid out in our post, A Trashy Celebration, only this time cutting the cakes in the shape of a badge. To create the shape, I printed a badge image on a piece of paper, printed it out and cut around it like a template. 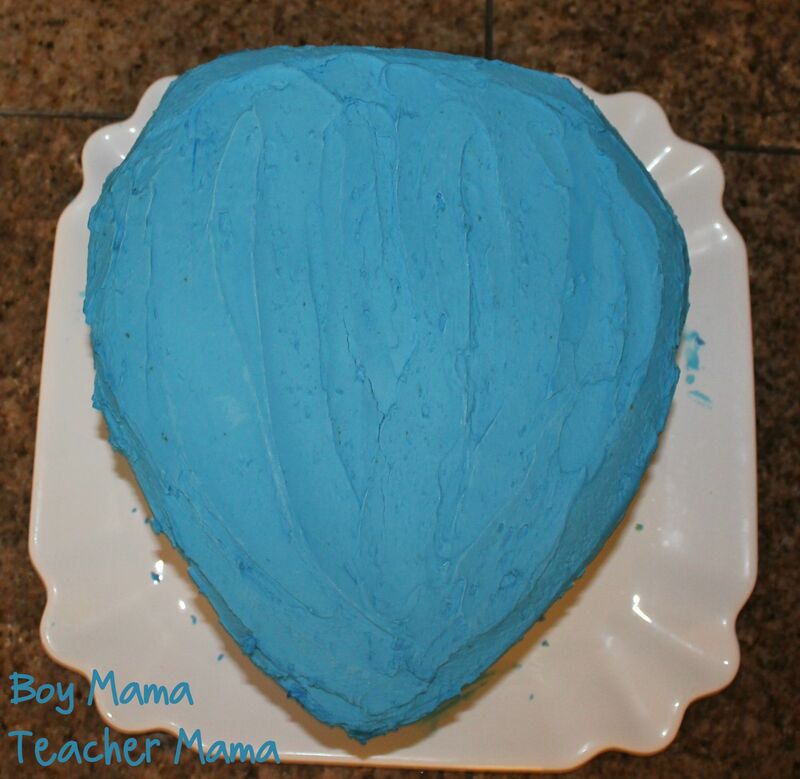 I then iced it with blue icing. I then used another paper badge I enlarged and printed and cut out the paw shapes. I placed it on the cake and used a toothpick to trace the shapes. Then, I filled in the shapes with white frosting and the cake was done! 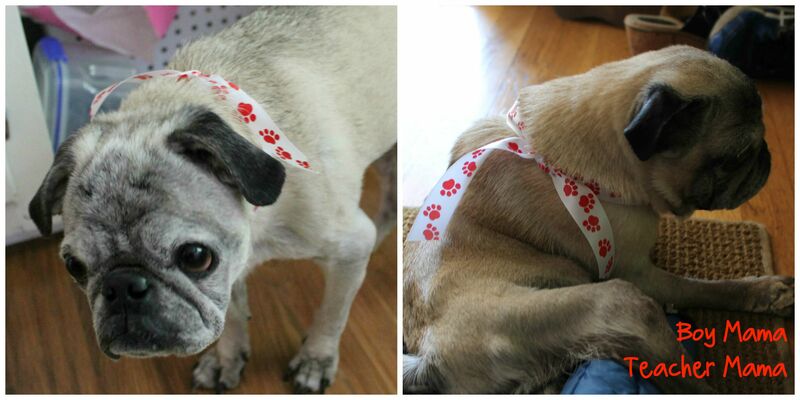 Even our Pugs got in on the fun! Hello! Would it be possible to get the food/water labels? 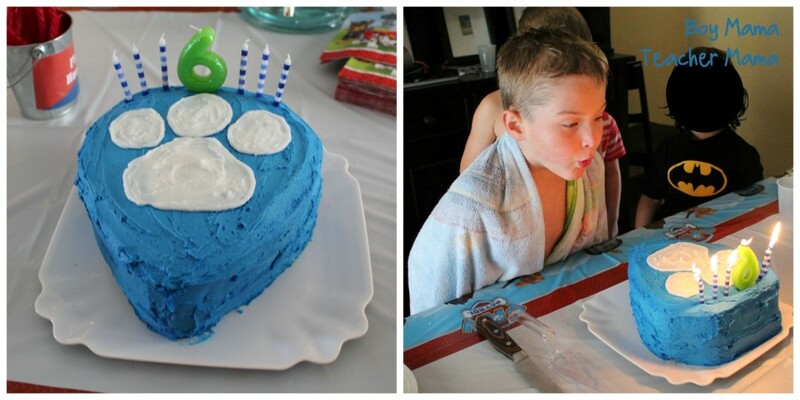 I have been trying to make some for my son’s 5th birthday and nothing I have tried has looked that wonderful! I’d greatly appreciate it! Super cute! Could you send me the template for the food and water labels? My daughter is obsessed with Paw Patrol! Please send me a copy of the templates for the buckets! I love them! Hello. I was wondering if I could get the template for the food labels please and thank you. I have been looking for labels and I love yours! Hi I love these ideas! Any chance I could get a copy of the printable please?? 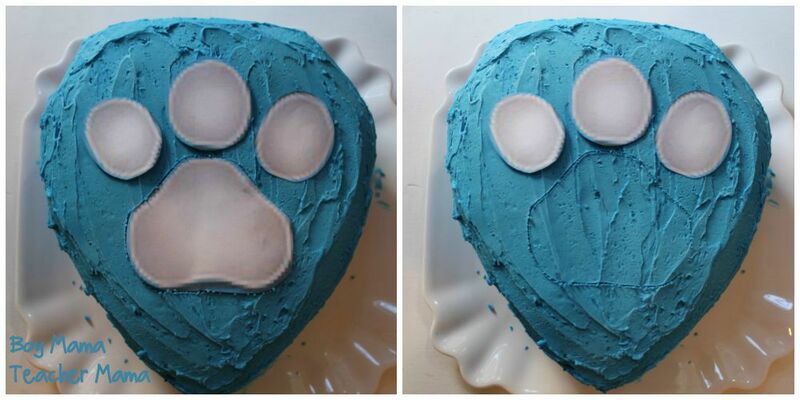 Awww water a paw-rific Birthday! 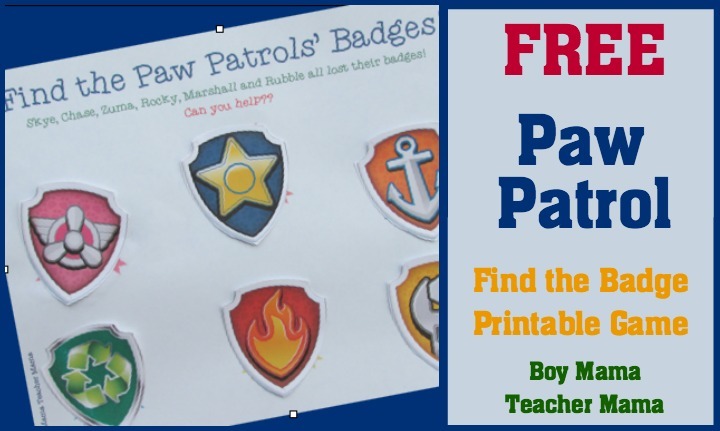 I will planning my sons Paw Patrol birthday and could really use your templates. Any chance you can send me them so I can customize it for my son…. Such a cute party. Thanks so much for sharing! If you wouldn’t mind, I’d love a copy of the scavenger hunt badges. Very interested in your printables if you didn’t mind. The invitations and the badges! Hey, I love these ideals. 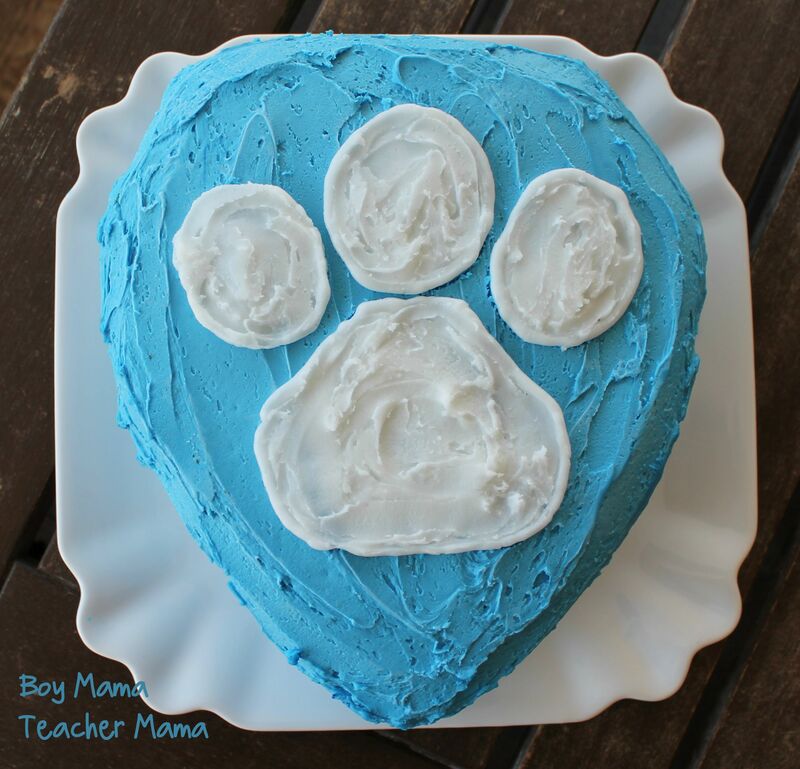 I’m getting ready for my son 5th birthday and he loves Paw Patrol. Are you still sending the information out? 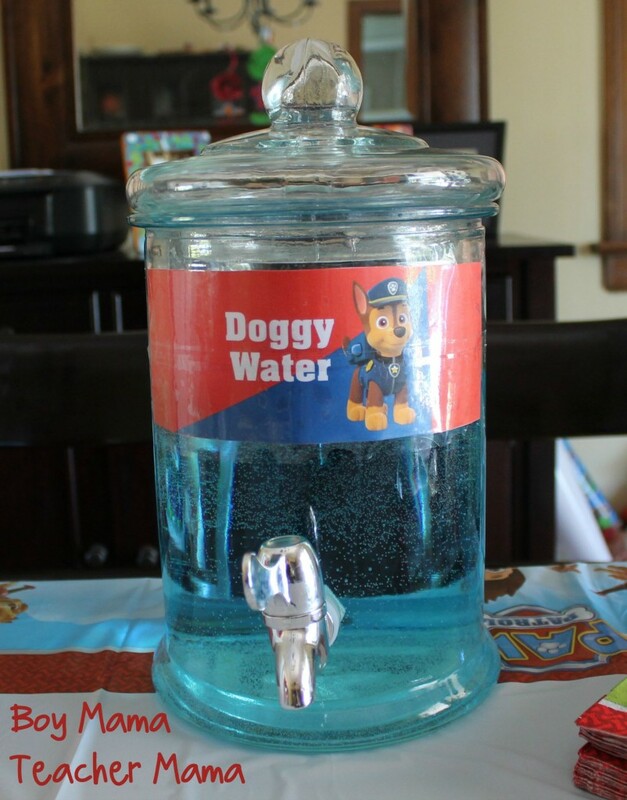 How did you make the “doggy water” sign? I made it using Pages. If you are interested in a copy, let me know! Love your party ideas! May I please use your printables for food/water? Are you still willing to share your printables? 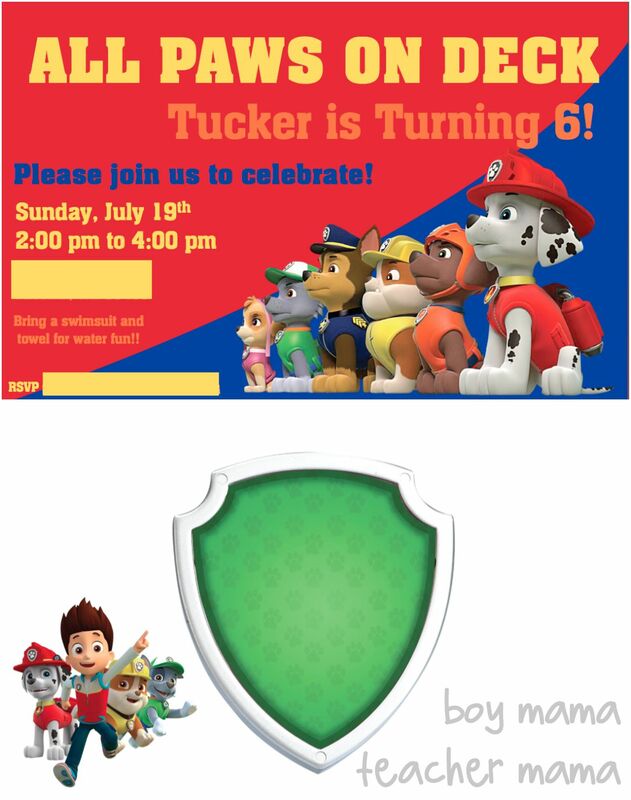 My sons party is next week and he loves Paw Patrol. Thanks! Hi. Thanks for the creative ideas. Im gonna try the koosh balls this Saturday for my youngest son’s 5th birthday. We are all paw patrol fans here. Hoping you might be able to share your templates for the food and water. These decor items really add to the fun. Thanks. I sent them along! Enjoy! Hi, can u please sent me the printables. I would love to use it for my sons birthday. 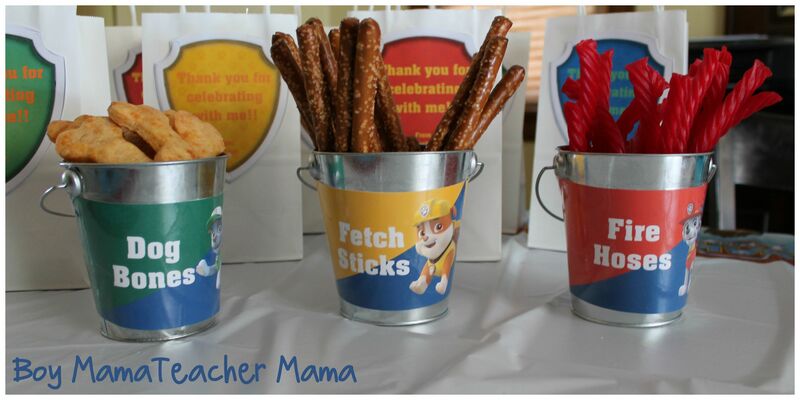 I would love to print off the labels for the buckets of snacks… My son’s birthday party is this Sat. 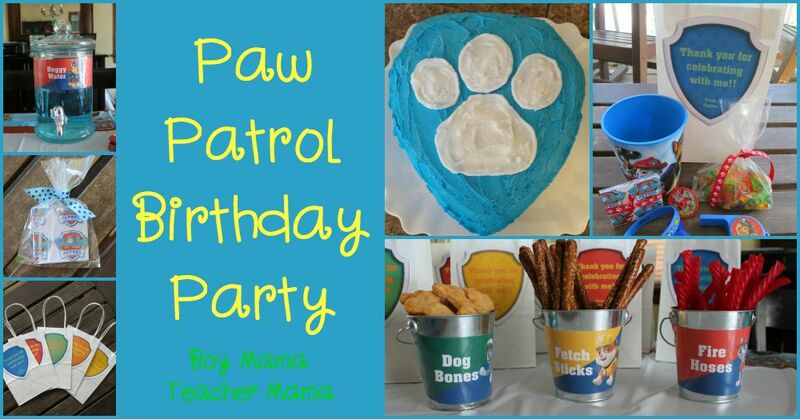 I LOVE all of your adorable PAW Patrol party ideas and can’t wait to use them myself! Thank you so much for sharing your creativity! I, too, would appreciate it if you would be willing to share your food/water signs. They are super-cute, too! Thanks again! The kids are going to love this! I would love a copy of your templates if they are available! Thanks so much! 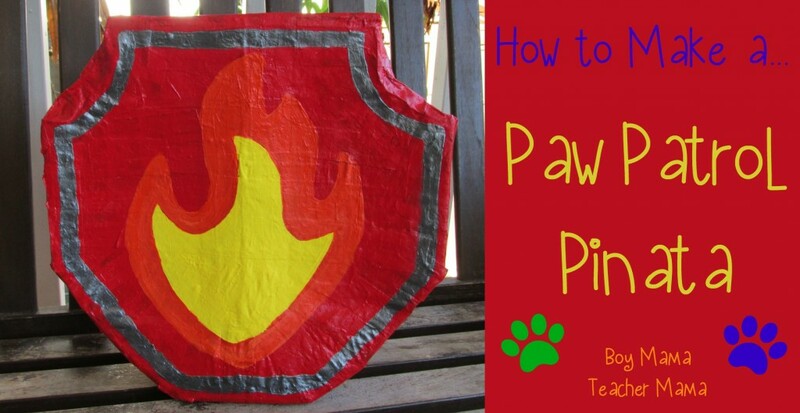 I’m doing a Paw Patrol birthday party for my nephew and I would like to know where you got your fire hose, fetching sticks, and dog bone templates at. I sent the templates. Enjoy! Please send an email request to [email protected] and I will send along the printables.